With more than 60 years of experience producing proudly American made loading dock equipment, Copperloy continues to be an industry leader. Throughout the state of Montana, we serve various industries, from agriculture, to heavy machinery, and more. We help businesses of various shapes and sizes who share a common goal — increasing their productivity and efficiency with safe, reliable, and durable equipment. Copperloy has a nationwide distribution network. We’re proud to distribute our products in Montana as well. No matter where you are within the state, we provide quick, affordable shipping and friendly customer service. Whether you’re in Billings, Helena, Great Falls, Missoula, Bozeman, or Butte, we’ll help you get the job done. You can count on our material handling equipment to hold up to the conditions and the elements. We produce a wide range of equipment, including: portable and mobile yard ramps, forklift ramps, truck ramps, and dock-to-ground ramps. This is in addition to our edge of dock levelers, dock lifts and lift tables, rail boards, dockboards, and more. Copperloy also provides custom steel fabrication and design services, when you have a particularly difficult or unique challenge. Our mobile, or portable yard ramps give the forklift easy access to trucks and loading docks alike. Since they are easy to maneuver they can be useful in most loading and unloading conditions, especially when room is tight and a truck can’t access the loading dock. Deep overlap of ramp frame at the high end assures that the ramp rests firmly on the carrier body or dock floor. Our portable yard ramps have eight foot long safety chains and hooks to provided added security and increase safety. When correctly rigged, chains join the yard ramps and vehicles into a single unit. Hydraulic hand pump quickly adjusts the top end of yard ramps to align with the bed of the vehicle or loading dock. That means you have the can precisely align the yard ramp after moving it. The handle is stored out of the way when not in use. The yard ramps have smooth side plates that enclose all working components and protect them from possible damage from other equipment. 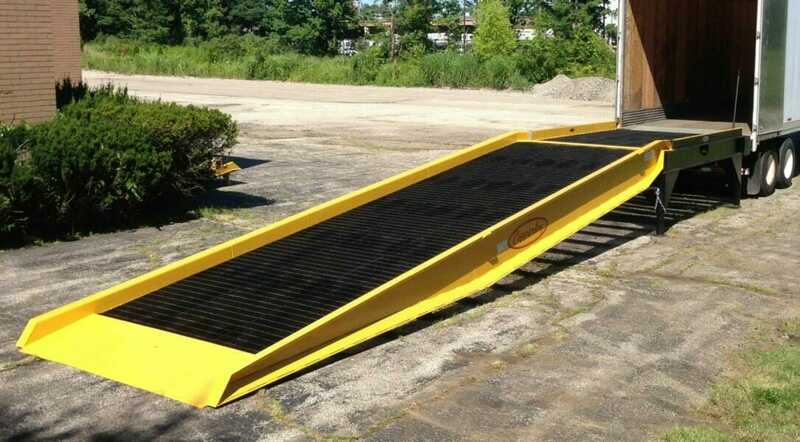 Our mobile ramp approach plate is 36″ long. Because the end plate is shorter than the wheelbase of most fork lift trucks, front drive wheels can reach high traction grating on the ramp while rear wheels are still on the ground. The portable yard ramp approach plate is beveled from the underside to provide a smooth ground-level entry, eliminating jolts and bumps when fork trucks travel on and off the ramp. All of our heavy duty yard ramps are constructed of High Strength steel for superior strength. Grating bearing bars are thick for durability in the roughest of applications. Bars are spaced 1″ apart to resist clogging of debris and to ensure al all-weather high traction running surface. Safety curbs (7″ on steel ramps and 7″ on aluminum ramps) prevent accidental runoff. Exclusive hollow section design and proprietary box frame construction take the stress of heavy loads and the extra strain of cargo breakout. (Standard on all mobile ramps). Premium 23″ tires, ideal for use in most applications. 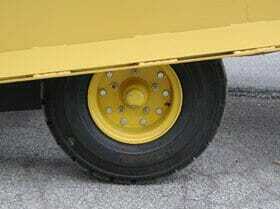 Air inflated tires create a cushion effect on irregular or bumpy surfaces. Solid Filled Tires- (Option on all mobile ramps) Ideal in applications where sharp debris could puncture a pneumatic tire. (Standard on steel container ramps). Provides dependable means of positioning the ramp into place from one truck to another. When not in use the sleeve is conveniently stored on the side of the yard ramp. Not intended for long distance towing. Optional. Provides dependable hitch for towing convenience and safety. 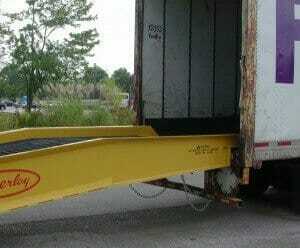 The towbar attaches to the lower end of the ramp and is used for long distance moving. Call the Copperloy team today at 800-321-4968 and we’ll help you get started with our industry leading yard ramps in Montana.